Browse > Home / Rebecca / Was Magdalen a Virgen? Was Jesus a Virgen? Does it matter? Was Magdalen a Virgen? Was Jesus a Virgen? Does it matter? 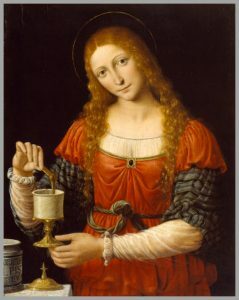 Burning Questions: Was Mary Magdalene a virgin? Was Jesus a virgin? What were Her early temple trainings like? *For the purpose of this book, Mary is allowing me to use the name Jesus or the Christ because that is the name most of us are familiar with. Keep in mind that this book is a series of early morning conversations between Mary Magdalene and I. Some of the chapters are very short…and some are longer. All are revealing and sometimes surprising! This is just a small sample of the chapters in this provocative book. As I am sitting here with pen in hand…I keep feeling Mary Magdalene wants to talk about the question burning in everyone’s mind… Was she a virgin when she came to Jesus? We already know they had wonderful, sacred, sexual encounters. (That old crap about Mary Magdalene being a harlot was total fabrication by miss interpretation. The arm bracelet she wore identified her as a priestess from the temples of Isis. Some interpreted the bracelet as a sign of being a sexual prostitute. Hm, had Christ been initiated in the sacredness of sexual/spiritual experience by his journeys in Mystery School teachings? PS: We have recieved some contributions to help with the publishing expenses of this book. Expenses are still in excess of 1600. All who contribute will be the first to recieve the eklectronic version uopn completion. Check your heart to see if it is right for you to contribute at this time. Maybe you are not called to write a book like this…however your financial contribution makes you a part of this.